Huawei sub-brand Honor is holding its next unveiling event in London on May 15. It has started sending out press invites for the occasion, and you can see the associated promo image below. That's obviously the outline of a smartphone, so it's pretty clear what the event will be about. The must-have buzzword of 2018, "AI", is present too, so you know this will be a high-end device of some sort. 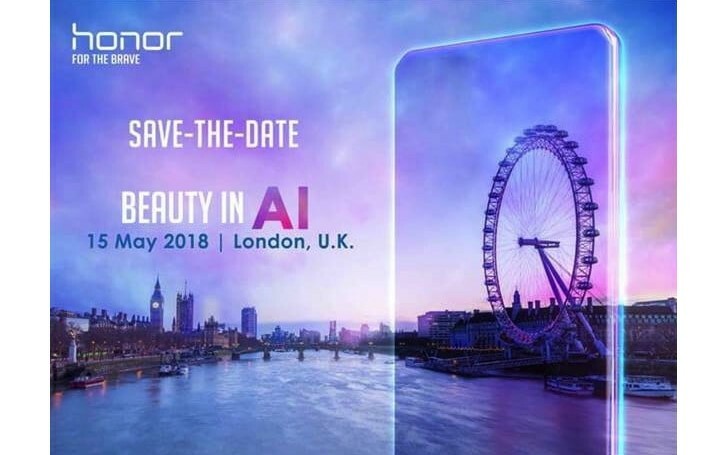 That's why we assume the Honor 10 is the handset in question, the one making its debut at this May 15 London event. It would complement the Honor View 10 in the company's portfolio, and should be smaller than that model. In fact, rumors have pointed towards it boasting a 5.7-inch touchscreen and the Kirin 970 chipset at the helm. Since the View 10 has a 5.99" display and is also powered by the Kirin 970, that would make perfect sense if we're to think of the Honor 10 as a smaller version of it. It will have a notch despite the haters.